David Jeffrey. Pic by Pacemaker. Ballymena United manager David Jeffrey has blasted the playing surface at the Showgrounds after Saturday’s 2-0 defeat to Linfield. Goals from Jimmy Callacher and Andrew Waterworth sealed the win for the Blues - but before tonight’s Danske Bank League clash against Cliftonville Jeffrey made his feelings about the pitch perfectly clear. “The surface is diabolical. Here we have a top-class facility and yet there is no point in having the surroundings and the framework if the pitch is not in good order. “And to be fair at the start of the season the pitch was in good order. 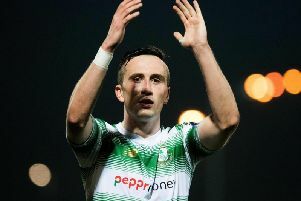 “But is has been slowing getting worse and it was fantastic to have the Irish Cup semi-final here. “Tremendous - but on the day of the match I walked the pitch and it was awful. “And Glenavon and Coleraine gave out about the state of the pitch. “We have made countless efforts with council employees to lobby councillors but it seems to make no difference. “And the icing on the cake was the night before we play Linfield there are tracks all over the pitch and we have pictures of cars parked on the playing surface.